Long before European explorers came to the Americas, the Waxhaw Indians inhabited the area near Cane Creek in the Catawba River Valley. They were a small tribe of the Siouan language group. The origin of their name is not known for sure, but it may mean People of the Cane, in the common trade language used by native groups. Like most native populations in the area, they tended to congregate and build small settlements near the rivers, which provided food, transportation, and of course, water. 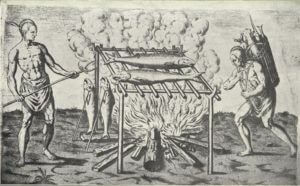 The Waxhaws were referred to as “flatheads” by early explorers and other natives. This nickname no doubt came from the tribes harmless practice of placing small sandbags on the foreheads of infants, resulting in wide-set eyes and a reshaped, flat forehead. In 1566, Captain Juan Pardo and a party of about a hundred men visited the Waxhaw Indians in search of a route west to Mexico to circumvent the dangerous sea voyage to Florida. This is the first known European contact with the Native Americans in this area. St. Augustine, Florida, had only been founded the year before. Pardo describes the Waxhaw village as composed of long lodges, typical of Eastern woodland Indian tribes, for homes, and an abundance of game. After the initial contact by the Pardo expedition, trade developed between the Europeans and the natives. As a result, the Indians lost the ability, over time, to make weapons and tools in traditional ways, preferring instead to trade food and deer hides with the Europeans in exchange for muskets and axes. John Lederer arrived in 1670 and referred to the Indians as the Wisacky. He noted that they were under the authority of the larger Catawba tribe. John Lawson, commissioned by the Lord Proprietors of England in 1701 to survey the interior of Carolina, kept a detailed journal of his travels. 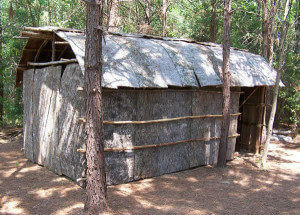 According to Lawson, the Waxhaw lodges were large and lightsome. The Indians made his stay quite comfortable. They sat on deerskins and dined on stewed peaches and corn. He noted their practice of flattening their foreheads, and also that they owned the largest iron cooking pots either he or any of his English trading companions had ever seen. Historians speculate that close to 2,000 Waxhaws lived here in two villages when Lawson made his journey. By 1720, most of the Waxhaws had been wiped out by the dreaded diseases brought over by European settlers, particularly smallpox. The rest were decimated during the Yamasee Wars, which pitted them against South Carolina colonists and larger, more powerful, tribes. The majority of Waxhaws who survived are believed to have been absorbed into the neighboring Catawba tribe. Others joined the Seminole tribes in Florida.